Contemporary Heaven is well known for its vast array of household wares, like it’s modern and antique style clocks, cushions and other soft furnishings, and storage options. If you’re a little bit short of fireside space but still want something stylish and contemporary, this is the one for you. Manufactured by Roco Verre in steel, then coated in a beautiful and hard-wearing chrome finish, this is a log basket and companion set combined. Hearth brush, tongs, shovel, and poker are all attached to the integrated log basket, so it offers a very practical solution for many of today’s homes, and great value too. What a beauty this is… and we know you’ll never find one anywhere else! 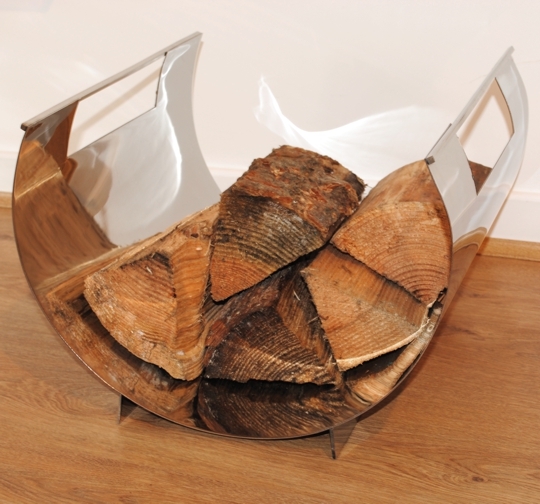 Truly unique and stunningly different this item features a large capacity curved and chromed steel basket that can hold a lot of logs. It looks great in any modern home and is 56cm long, 42cm wide, 28cm high and weighs a hefty 4kg. Simple designs are often the best. There’s beauty in simplicity… less is more some would say, and the Blomus Chimo Log Basket is one of those designs. Featuring an elegant curved stainless-steel basket sitting on two black legs, it incorporates two black rubber lined handles on the sides for ease of movement. With a brushed stainless finish and rounded corners, it’s a modern design that wouldn’t look out of place by any fireplace.